The strongest team in the IPL was playing against the team which has been into the slums from past three seasons. Looking at the team sheets and their past performance CSK entered the match as the favourites but with some real match winners in the side Delhi was capable enough to create a upset. 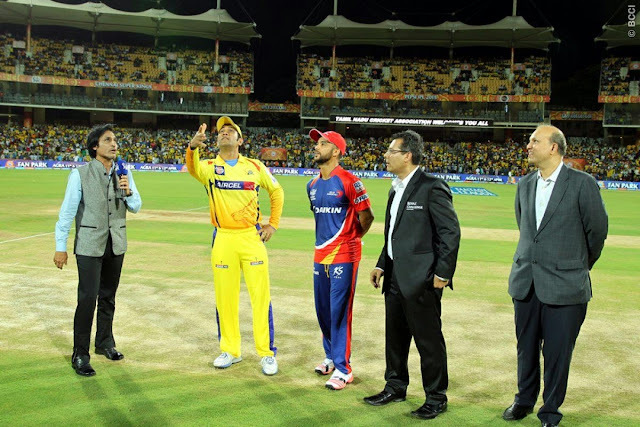 JP Duminy, new captain of Delhi Daredevils won the toss and put Chennai Super Kings on to bat. 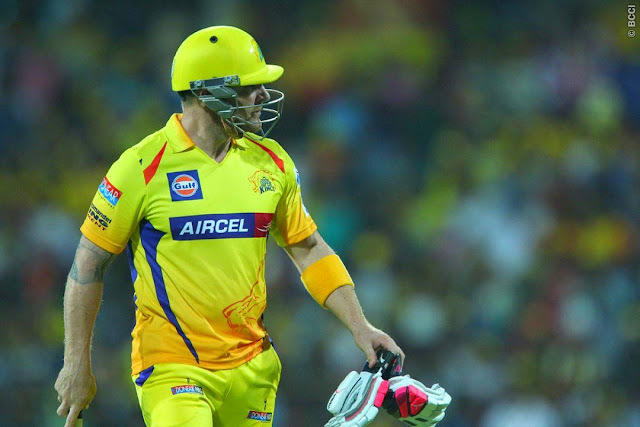 CSK didn't made much changes in its team from the past season and all the players who were part of the team in the previous edition were on the field. Delhi Daredevils made drastic changes in its team and most of the players were playing for the franchise for the first time. Chennai didn't had the best of the start to there innings as Brendon McCullum didn't came out of the mood which he had in the ICC World Cup final and lost his wicket pretty early like he did in the prior one, The only difference was that he managed to score a boundary and instead of disturbing the timber he took the help of a fielder to get him out of the business. Suresh Raina on the other didn't came out of his honeymoon phase and was pretty eager to leave the field and he managed to do that when he in the process of trying to slog the ball out of the park just managed to get bails off the stumps. Dwayne Smith and Faf du Plessis tried to stabilize the innings but it wasn't late when Dwayne Smith lost his wicket to Imran Tahir who bowled a pretty good and economic spell in which he only conceded 27 runs in his 4 overs and also took wicket of Smith. Chennai kept on losing wicket continuously at regular intervals and just managed a below par score of 150 runs thanks to some sluggish batting from Dhoni and Jadeja. Nathan Coulter-Nile was the pick of the bowler's as he took 3 important wickets of McCullum, Raina and Dhoni while conceding only 30 runs. Domnic Joseph, Imran Tahir, Amit Mishra and JP Duminy managed to pick up one wicket each. 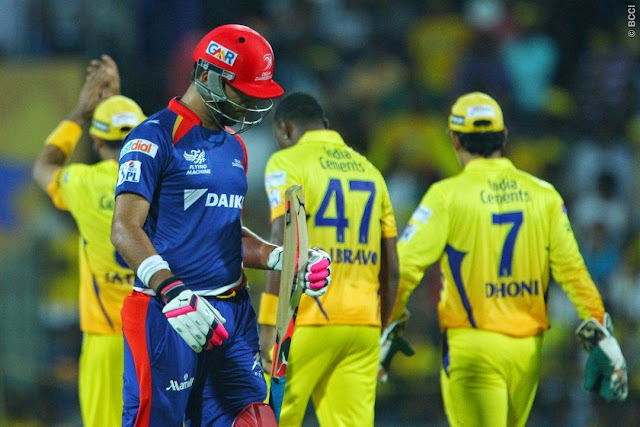 Delhi Daredevils like Chennai Super Kings had an awful start to their innings and lost 3 wickets at the score of 39 runs only. Albie Morkel was the only player who looked like someone who can help Delhi to cross the line but he didn't got much support except a small hand from Kedar Jadhav. Much was expected from the lights of Yuvraj Singh and JP Duminy but both of them lost their wicket in successive overs. Albie Morkel was playing well but it was much of a tired knock. It was a rare impossibility that Delhi Daredevils will reach the target as they kept on losing wickets regularly and they required 19 runs from last over with just 2 wickets in hand and with Albie Morkel on strike. The first two balls yielded only 5 runs and it also put Albie Morkel off strike and Imran Tahir on strike with 14 required of 4 balls. Imran Tahir lost his wicket in the process of hitting the ball out of the park but most importantly it put Morkel on strike as they crossed over. Morkel smoked the 4th ball of the over for a six and smashed the 5 ball towards the point which was a certain boundary except Suresh Raina as he does all the time saves it with a sensational piece of fielding and kept it to just two runs, which meant DD required 6 of the last ball and with Albie on strike it was still possible and he almost did it but the ball just dropped a few steps inside the boundary ropes. The result came as it was expected, but chasing only 150 runs on a pretty decent batting track and a strong batting line up Delhi should have chased the same. Albie Morkel almost did that for them but the lack of partnership and lack of support just didn't helped the cause. Ashish Nehra was judged as the Man of the Match for his economical bowling spell of 3 for 25. It was a pretty close cricket match which just ended up in the favour of the home side due to some mistakes in the batting of the guests. Chennai will be happy with the results but will like to take a note on their batting while Delhi Daredevils will like to do some changes in their batting order. They cant keep a guy on the bench till 13 overs who costed 16 crores rupees. Chennai Super Kings scrape Delhi Darevils in IPL 8.